My last box of Fleer Ultra wasn't too bad, but I expected more out of it. Fleer Ultra is a shout back product to the 90's when insert cards were all the rage. 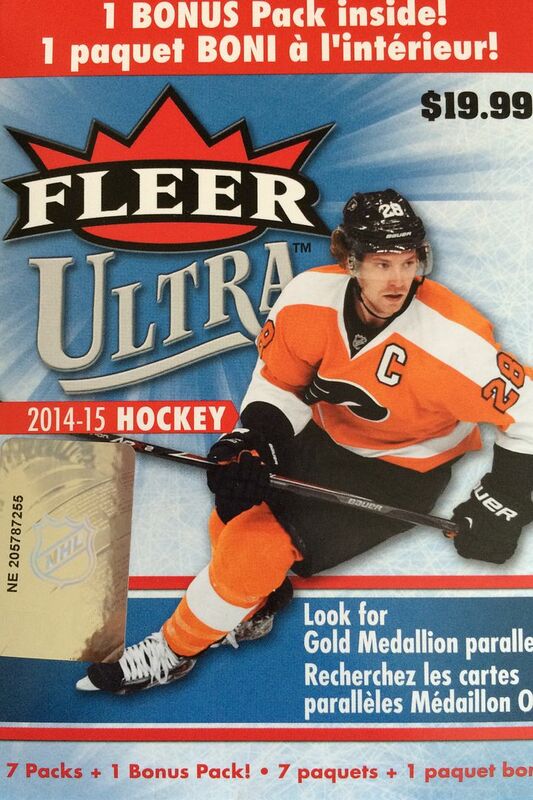 This year's version of Ultra should come packed with interesting insert cards and parallels. I really hope this is a fun break with cards that look cool because I'm not expecting to get an autograph or memorabilia card in here. This blaster box wasn't too expensive. I'm not sure how I would feel paying the full $20 retail price, but half that is okay. You get a total of 8 packs when you purchase a blaster, and hopefully some nice cards come out. One thing that I'm not really looking forward to are the base cards. 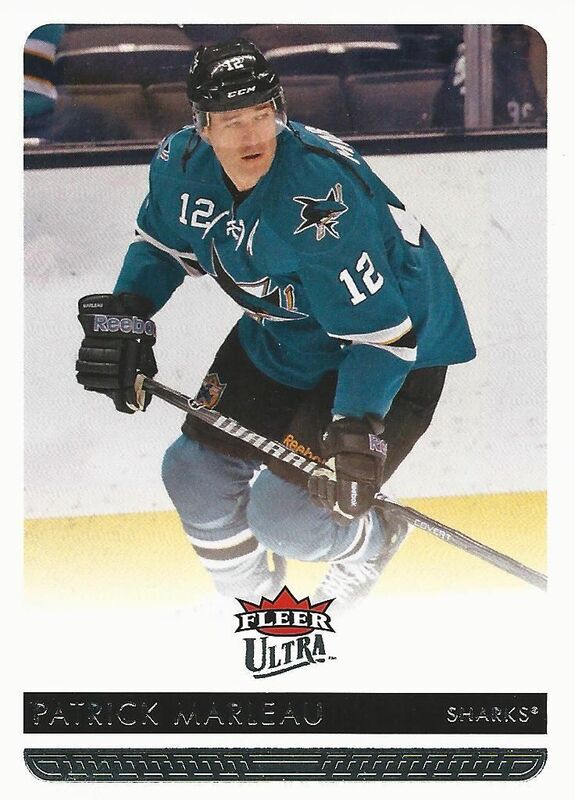 These base cards remind me more of regular old Fleer cards rather than Ultra. Ultra was always known to be more glitzy and glamourous. The boring white borders of this year's base set are totally uninspired. Autographs are possible hits in this blaster, but they are extremely rare. Like I said, I won't expect that, but a nice die-cut insert would certainly make my day! Ummmm... what happened here??? This was seriously a worst box of the year type of break. As I opened the packs and get base packs and more base packs, I was more and more discouraged. It was definitely not fun going through the cards and finding nothing really of interest. My only 2 non-base cards were my gold medallion base parallels... and they were not anything special. I am thoroughly disappointed with this blaster of Ultra - it definitely feels like a wasted effort. I just can't say anything exciting - event the least bit - came from this blaster box. Really, there's nothing else to say about it. 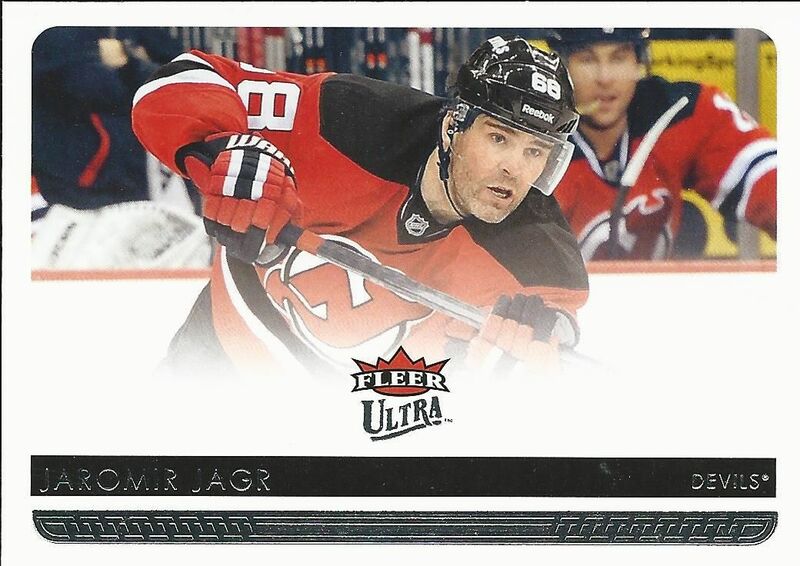 Maybe Jagr was the biggest name in the blaster? Maybe.. but I really just picked this card because its horizontal orientation stood out to me more than most of the other cards in these packs. Alright, well, might as well show some Sharks homer-ism by picking the only two Sharks I got as my numbers one and two. Patty gets two because his photo here is just oh-so-forgettable. 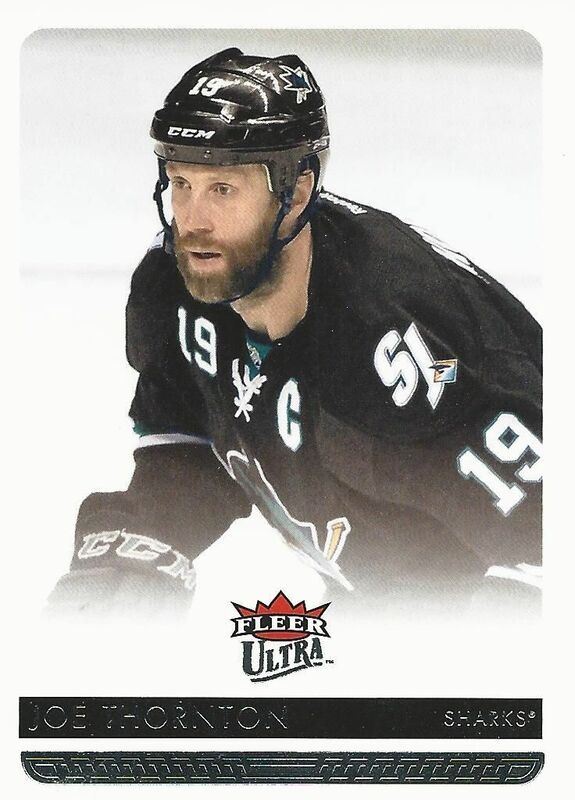 Jumbo Joe's picture is a little better as he is a bit more bold on it, plus he's sporting that cool looking Sharks third jersey. Terrible blaster! I would probably have not even had to pay a dollar for all those cards if I were to get them at a store or card show. This was definitely a bad blaster and a negative breaking experience. I sure hope next week's is better! The same thing happened to me. I was very disappointed, my best card was a Subban gold. A fellow collector I know got redemption and ticket cards from these blasters he said! Can you send me email?